How do you feel about the term Minimal Art?’ asks the art historian Barbara Rose. ‘Well I don’t like it,’ replies Donald Judd, leaning into the table and smiling shyly. ‘What’s minimal about it?’ Scattered across the bare floorboards of the warehouse loft behind him are a tricycle, a child’s painting, a small forest of cacti in terracotta pots, a toy truck and an open trunk. This footage, from a film made by Michael Blackwood called The Artist’s Studio, was shot in 1972 on the first floor of 101 Spring Street, Judd’s five-storey home in New York. He bought the building in 1968 for $68,000, in an industrial neighbourhood that was just beginning to be colonised by artists. At around the same time, it became known as SoHo. The area was notable for its distinctive cast-iron buildings, of which Judd’s was a fine example: designed by Nicholas Whyte in 1870, it was used as a shop and a factory for the textile industry. Following a $23m renovation project that has been 11 years in the planning, fundraising and execution, you can now make an appointment with the Judd Foundation to visit 101 Spring Street, where furniture, artworks and Judd’s possessions are placed as the artist left them. The tricycle and the cacti have gone, as has much of the other clutter that must have filled the space that the artist shared with his wife, until they split in 1976, and their two young children, Flavin and Rainer (named after Judd’s artist compatriots Dan Flavin and Yvonne Rainer). But much remains: a shelf of bottles – whisky, mescal, tequila – most still half full. Judd’s clothes hang in a closet, and his bed has been made with crisp white sheets. Judd felt that he was often misrepr-esented by museums and the art historical establishment. That is why he rejected the label ‘minimalist’; it is also why, in 1972, he bought property in the small west Texan town of Marfa, moving there with his children in 1976 and permanently siting his art in the buildings he acquired. Even while living in Texas, however, he retained 101 Spring Street, using it as a base when in New York or en route to Europe. 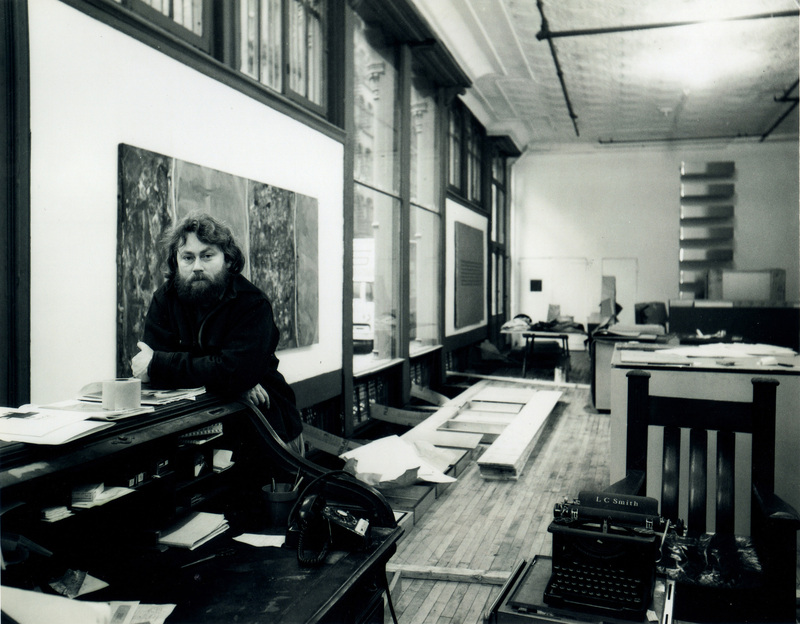 As has happened in Marfa, the Judd Foundation hopes that 101 Spring Street will enrich the public’s understanding of Judd’s mission through the integration of his art, architecture and furniture among the trappings of his daily existence. ‘It’s the nature of museums that the complexity of a person’s life gets reduced,’ says Rainer Judd, co-president (with her brother) of the foundation. ‘If you really want to get into somebody’s art you need to get a sense of where they lived and what they were thinking.’ Judd has a reputation – thanks, perhaps, to his early work as a critic – as being a stern ideologue, an extreme proponent of high Modernism and a radical obsessive who had to move to Texas to remake his own art world from scratch. A visit to 101 Spring Street reveals a much more nuanced and surprising portrait of the man known by everyone at the foundation simply as ‘Don’, an impression that is affirmed by the softly spoken figure who appears in Blackwell’s film. Flavin points out, as another example, the bronze Etruscan lamp holders that live on the third floor of the building – a refined dining space with Gerrit Rietveld chairs placed around Judd’s self-designed table. A glorious day-glo Protractor painting by Frank Stella from 1967 dominates the largest wall, but is offset by the slender Etruscan lamp holder placed in the centre of the table. ‘It is basically an Ionic column – it has nothing to do with any idea of Modernism or reducing anything to anything else. It’s all nonsense!’ exclaims Flavin. Judd was clearly not opposed to ornamentation per se, merely the excessive and pretentious decoration that is applied to objects to make them look like things they are not. The lamp holders are elegant but honest, functional objects. Two floors below, in the kitchen area, a squat potbelly stove is a magnificent example of decorative but purposeful design. When stacked with wood in the winter, its cast-iron surface would glow white hot and heat the whole building. On the ground floor, a space Judd initially used as a studio but which later became a viewing area for art, he retained an early 20th-century mahogany roll-top desk and chair that had been left in the building when he bought it. With its carved wooden handles and bevelled trim, the design could hardly be said to be reductive, but it is solidly built and well proportioned, qualities that appealed to Judd. Indeed, even the exterior of 101 Spring Street is somewhat ornate, consisting of 1,300 separate cast-iron sections that were individually cleaned and repaired during the refurbishment. The strength of the structure, however, allowed for large windows along two sides of the building – as Judd himself wrote in 1989, the ‘furthest forerunner of the curtain-wall’. Unlike most buildings of its kind, its facade did not mimic stone or brick, but represented its own materiality: iron, today painted battleship grey. Extreme care has been taken during the restoration not to alter anything unnecessarily. While certain concessions had to be made, including a (well-hidden) fire suppression system, a climate control unit, and red Exit signs, elsewhere the pressed-tin ceiling panels are peeling away and stained by oil from the building’s former life. Judd wrote: ‘I thought the building should be repaired and basically not changed. It is a 19th-century building. It was pretty certain that each floor had been open, since there were no signs of original walls, which determined that each floor should have one purpose: sleeping, eating, working.’ Having removed any internal walls and cleared out the debris left by the previous owners, he then began the careful process of locating objects – artworks, furniture and furnishings – throughout the building. ‘I spent a great deal of time placing the art and a great deal designing the renovation in accordance. Everything from the first was intended to be thoroughly considered and to be permanent,’ he wrote. Therefore, in most cases, 101 Spring Street today still reflects Judd’s original vision. This is especially striking in his second-floor studio, in which an untitled, five-foot-high steel box, open at each end, fills much of the space. Judd made it in 1970, and installed it in his studio soon after (it is visible in Blackwood’s film). Too high to be a table, too low to walk through, the sculpture did nothing other than take up space. ‘For Don, the studio was a place to look at things,’ says Flavin. This was true too of the small rug and East African headrest that was placed on the floor nearby; the artist never lay on it, according to his son. It was purely an object of contemplation. Other objects that Judd liked to look at include the African ceremonial masks that glower at visitors as they ascend the staircase running from top to bottom of the building. Here, too, is where the Japanese Shingon banner is hung. Nearby are drawings by Dan Flavin, as well as bentwood furniture by Alvar Aalto. Judd was a great supporter of artists of whose work he approved; he commissioned his friend David Novros to paint his first fresco for 101 Spring Street, a grid of subtly coloured panels across the wall of the first-floor living area. On the uppermost floor, which served as Judd’s bedroom, sculptural works by John Chamberlain, Claes Oldenburg and Lucas Samaras hang alongside two important reliefs by Judd himself, from 1961 and 1962, the period in which he was making the transition from painting to three-dimensional forms. Stealing the show, however, is a giant light installation by Dan Flavin that runs the length of the building: resembling a long fence made from blue and orange fluorescent tubes, the work commemorated the birth, in 1968, of Judd’s son. At night, the artwork is the bedroom’s only illumination. While they were young, Judd’s children shared the sleeping floor with their father. In Rainer’s partitioned chamber hang drawings and paintings by Honoré Daumier, Stuart Davis, Kurt Schwitters and Jean Arp; her brother, meanwhile, slept on a raised mezzanine platform overhead, accessible by a Judd-designed ladder. Placed casually in his loft is Marcel Duchamp’s bottle rack – although, it turns out, it is not by Duchamp at all, but an identical object found by Judd; a readymade Duchamp, as it were. The snow shovel hanging nearby, however, is bona fide: a 1964 edition of Duchamp’s iconic In Advance of the Broken Arm. What must it have been like for the children to have grown up in such a rarefied bohemian environment? ‘I was always pretty aware that we had a different life and my dad was an artist, but he was well known only in this small, bizarre circle,’ says Rainer. ‘It was kind of like having a parent who was a scientist or something.’ Flavin declares it to have seemed completely normal, since they knew no different. ‘[The house] was big and we got to run around everywhere. I didn’t realise until later that that was a rare thing in New York. Most people are in shoeboxes.’ ‘The only rule,’ adds Rainer, ‘was that we weren’t allowed to put our backpacks on the table, because we used to leave them on the side- walk. You’d move your homework over to eat dinner. We had a TV on the second floor, by the Novros fresco, and there was a big African bench.’ The televisions, like the children’s toys, have now gone. In a corner of Judd’s studio floor is a small, high-ceilinged library. Most of the books have been transferred to the Judd library in Marfa, so only a few of the artist’s knick-knacks remain: a fur hat, two white cowboy hats, two hurling sticks, a horse whip, a collection of stones, and an African drum made out of a turtle. The artist was, his daughter says, ‘a total packrat’ – a characterisation that may surprise those who credit him with pioneering a minimalist style of loft living. Indeed, there seem to be few storage spaces at 101 Spring Street (a cupboard in the kitchen was kept empty, reserved for puppet shows that the artist would perform for his kids). His collection of green spatterware ceramic bowls is lined up under a table. Judd’s strategy for coping with his acquisitive nature? ‘He used basements!’ says Rainer. ‘There was a truck that would go to Texas all the time and there were a lot of basements in Marfa!’ She says her father not only hated waste but was also very sentimental, so ref- used to throw anything away. ‘Every single item of children’s clothing that we ever wore would go into a box.’ Born in Missouri in 1928, Judd was both the product of his post-Depression, Midwest upbringing and a fugitive from it. As Flavin puts it: ‘He could have inherited that way of living but he didn’t. He was dissatisfied with a lot of different things and he had to make his own answers to address those dissatisfactions. The result was the way he lived.’ While he may have felt more at home in small town Texas than in New York, he was nevertheless appalled that it was impossible to buy furniture anywhere near Marfa that was not fussy, poorly made or an ersatz imitation of another style. So he made his own. ‘And if you’re somebody like Don and you start making your own furniture,’ says Flavin, ‘it’s not going to look like anyone else’s furniture.’ Judd’s simplified, sometimes austere designs became popular; though they were eventually sold commercially they were never mass-produced. He was not so concerned with his furniture being democratic, says Rainer. ‘He was for things being made beautifully, one by one, locally if possible.’ They were never cheap because Judd insisted on them being made to the highest standards. Rainer remembers walking through SoHo one day with her father. At school, some children had been using the word ‘elitist’. ‘I asked him, “Dad, what is elitism? Are you elitist?” He laughed, and replied “Sure! I’m elitist. The difference is I want to be elitist all by myself.”’ He was not interested, Rainer understood, in being part of any club or movement. While SoHo was at the time, home to a thriving community of artists, many of whom Judd was in contact with, she describes him as ‘not an outrageously social guy’. Turns out he was right. Today, flanked by shops for Farrow & Ball paint, Cutler & Gross sunglasses and Burton snowboards, 101 Spring Street stands as a testament to what the area once was: a place where one man could find a little space, light and quietness, and invent for himself a way of living that was entirely his own.